Toru Fukubayashi led us on our pilgrimage to the memorial for Capt. Ogata and the men of the Z Square 8, and to the crash site where my uncle and four others had been found in the rear fuselage of their B-29. On our way up the steep, narrow and winding road to Mt. Futatabi, we stopped at a look-out point over looking Kobe City. 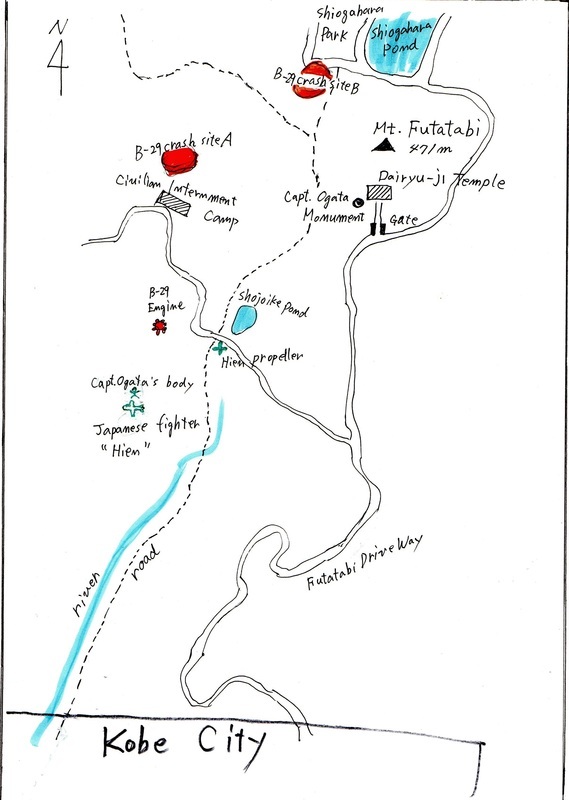 While there, Hiroko talked with my family and I, and Mr. Fukubayashi indicated on a map where we would be going. Kahori Sakane and T.K. Did an excellent job interpreting for us. Next stop was the Dairyuji Temple where the memorial is located. Feeling it would be too emotional for her, Hiroko did not accompany us to the actual temple or memorial site. 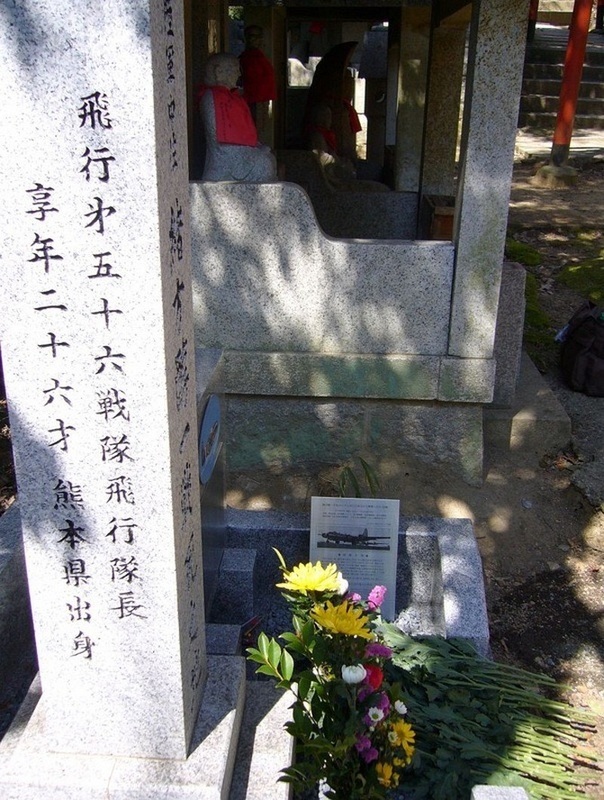 So we placed the flowers and lit the incense she had brought to honor her father and the crew of the Z Square 8. It as a solemn occasion, and we each said a prayer in our own way in honor of these boys who had died 70 years before. T.K. also translated what was written on each side of the memorial for us. 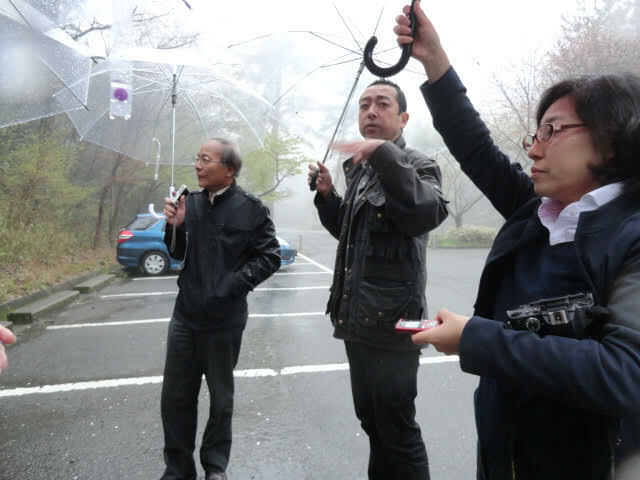 Proceeding on, we traveled to the base of the hill where the rear fuselage containing my uncle and four had crashed. 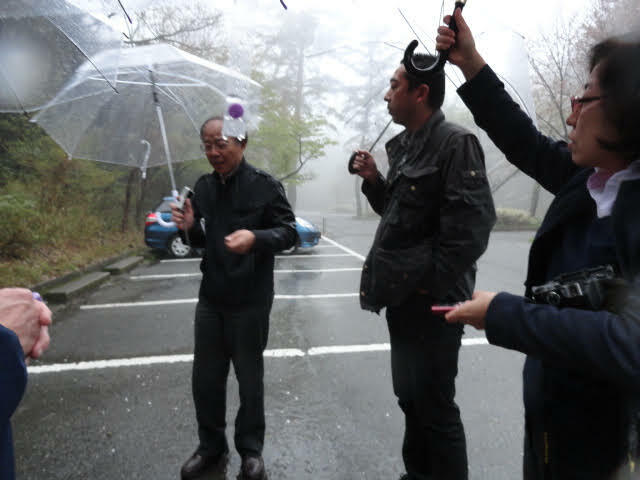 Unfortunately while we were in Kobe, they were experiencing torrential rains and high winds, making it impossible and impractical for me to climb to the actual crash site. A good excuse for another journey to Kobe. 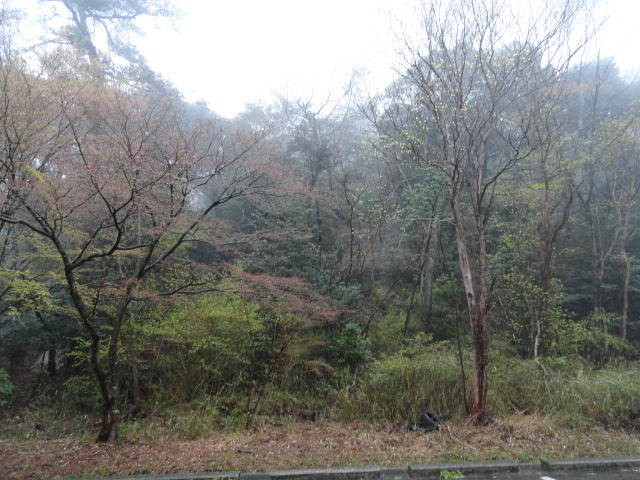 The Hyogo-Ken POW camp has obviously been gone for decades. 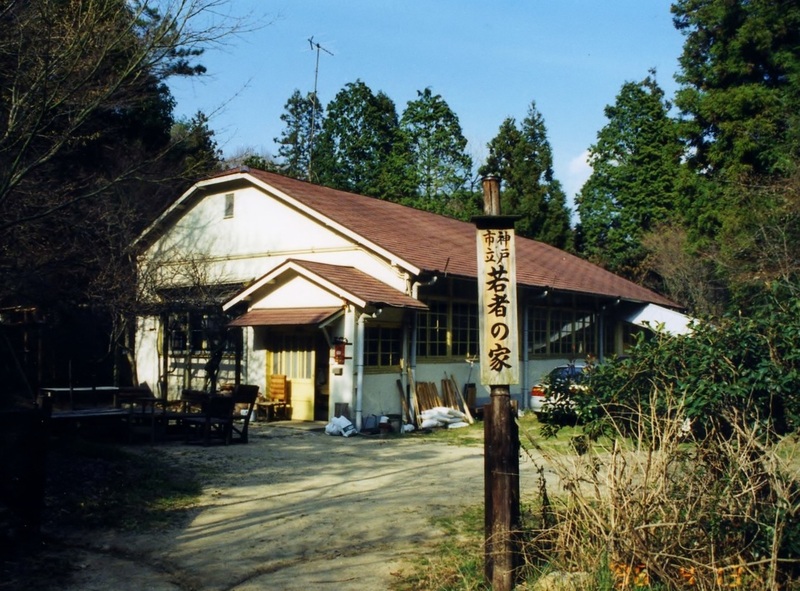 Since WWII, two schools stood in its place, the Kobe Municipal House for Youth and the Hifumien School for the Mentally Handicapped, but both were closed and demolished many years ago. 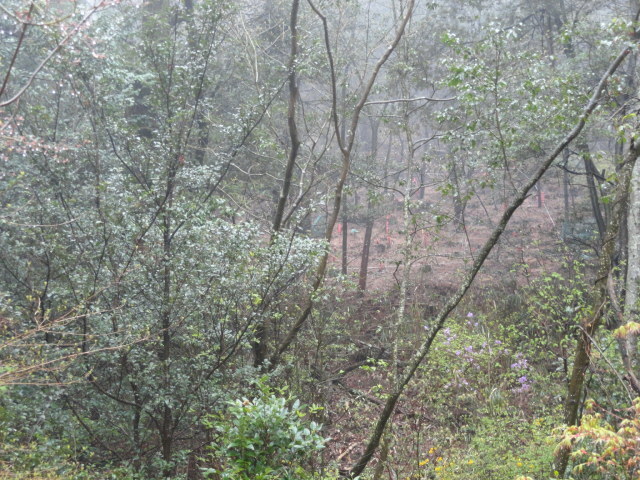 Nothing now stands on the site of the old POW camp. I am thankful I was able to make this journey, and humbled by the experience. 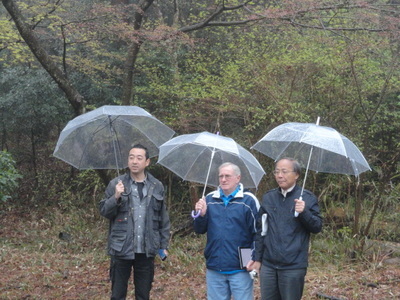 Hiroko, Toru, Kahori and T.K. were extremely kind and very interested in my research, and have now become friends to my family and I. This trip enabled me to finish another chapter on my saga to find out about my Uncle Bob. But there are more chapters to be written. We hope you will join us on our journey. Hiroko, Capt. Ogata's daughter, who surprised me by traveling alone for over two hours by train to meet me in Kobe. She was an absolute delight, and my family and I developed a wonderful bond with her almost immediately. A bond that will last a lifetime. I will only use her first name to protect her privacy. 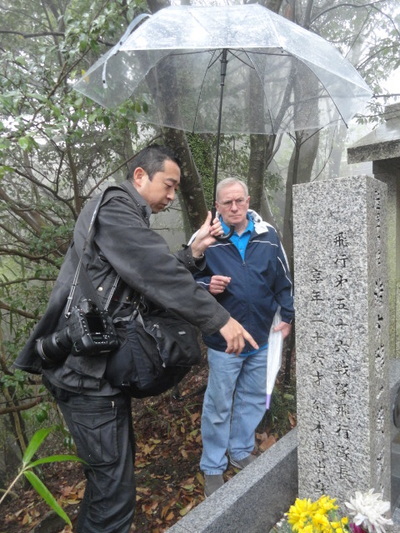 Toru Fukubayashi, my dear friend and Japanese Historian and expert on allied POWs in Japan during WWII. Toru continues to contribute to my research and his knowledge is invaluable. 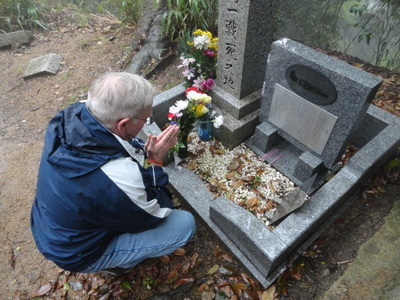 He was the inspiration for my trip to Japan, and I am thankful he was with us in Kobe and Osaka to further our understanding of what occurred on 17 March 1945. Kahori Sakane. Reporter for the Yomiuri Shimbun Newspaper, Osaka. Our interpreter and energetic reporter who would write the story about my meeting Capt. 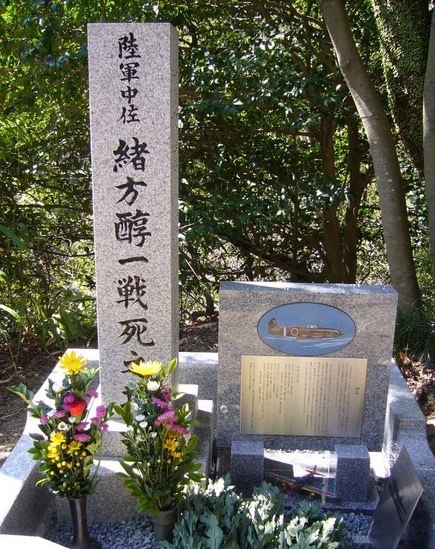 Ogata's daughter and visiting the crash site, memorial and Osaka Castle. She accompanied us the entire day, and supplied all of travel arrangements. Best of all.....when we met her that morning she informed us she had contacted Capt. Ogata's daughter who was going to meet us. I had no prior knowledge. Surprise! Tetsuya Kikumasa (TK), Cameraman for the Yomiuri Shimbun Newspaper, Osaka. Our 2nd interpreter and a great guy who took phenomenal photos of us in some very bad weather. TK made the day even more special just by being there. Yomiuri Shimbun Newspaper, Osaka. 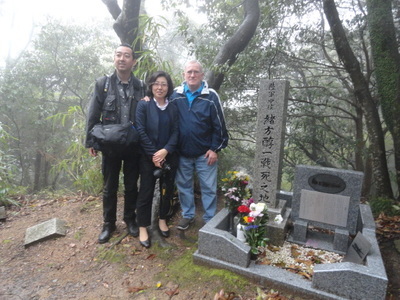 SPECIAL THANKS and acknowledgement to this newspaper for agreeing to publish an article on the meeting of Hiroko and me on the 70th anniversary of the death of her father and my uncle. And for allowing Kahori and TK to accompany us. We have tried to identify and notate all material and photographs attributable to the newspaper. 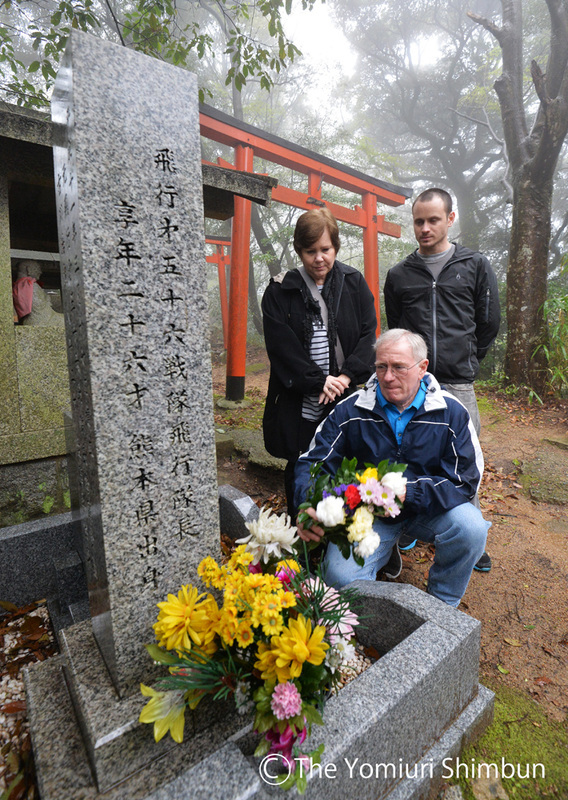 My wife Janice, my son Matt, my daughter in law Nittaya, and my grandson Raleigh, for their support of my research and for accompanying me on this pilgrimage to Japan. They made the trip extra special. Extraordinary day! 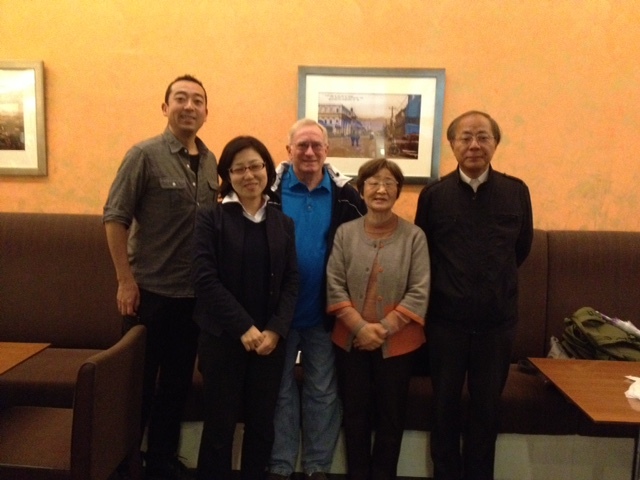 In Kobe for brunch before heading to the memorial and crash site of Z-8 and Capt. Ogata. Ms. Sakane surprised us this morning by telling us that Captain Ogata's daughter had come from Yokahama to meet me. Made our trip extra special. 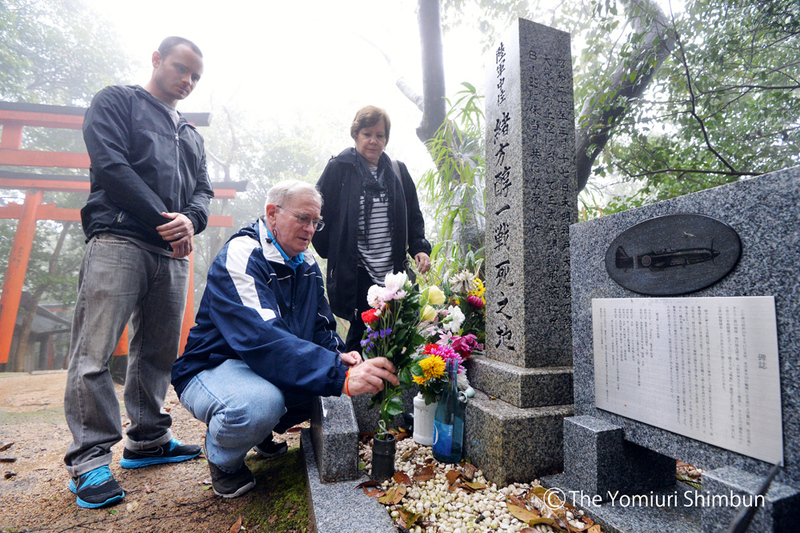 The story of Captain Ogata's daughter and I meeting 70 years after the crash is being reported in the Japanese newspapers with photos. 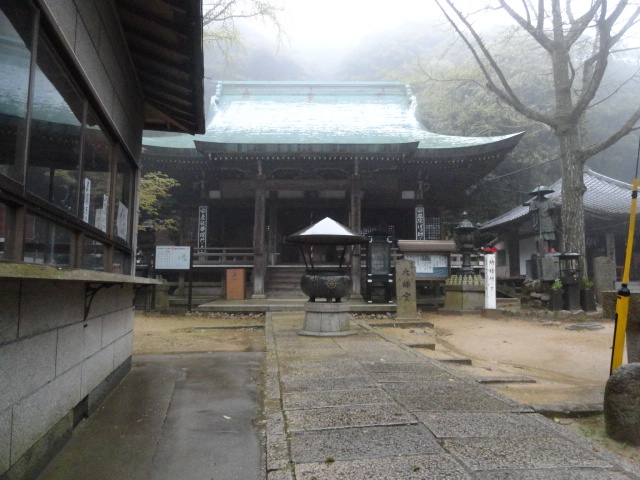 Dairyuji Temple today. 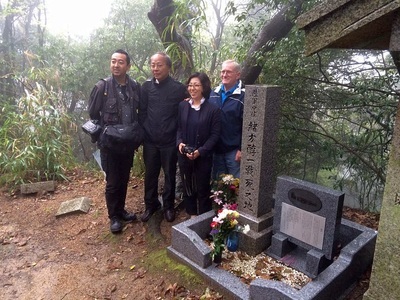 On 17 March 1945, Priest Jinsho Inoue and his wife Yukiko were informed by a young man who worked for them of an enemy plane having crashed near their temple. They found the tail section of the Z Square 8 containing the bodies of my uncle and gunners Holley, Cutler, Barry and Wray inside. Upon their arrival, the Japanese Army cordoned off all of the crash areas and began to remove all the wreckage. They intended to use whatever wreckage they could recycle for their own war machine. Below are gallery of select images from our visit to the crash site. "B-29" States: Capt. Ogata and crew members of B-29 died. Capt. Ogata in an Imperial Army fighter "Tony" rammed into B-29 on March 17, 1945 over Dairyuji Temple during Kobe bombing. Both went down. My son, my wife and I paying our respects to the fallen. We placed the flowers and lit the incense given to us by Capt. Ogata's daughter, Hiroko, in honor of her father and the boys on my uncle's B-29. Map of crash site and memorial provided to us during our visit to Kobe, Japan by our friend, Japanese WWII Historian Toru Fukubayashi. Hyogo-Ken civilian internment POW camp was 700-800 meters west of Capt. 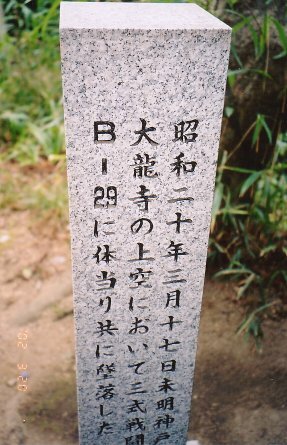 Ogata monument. Capt. 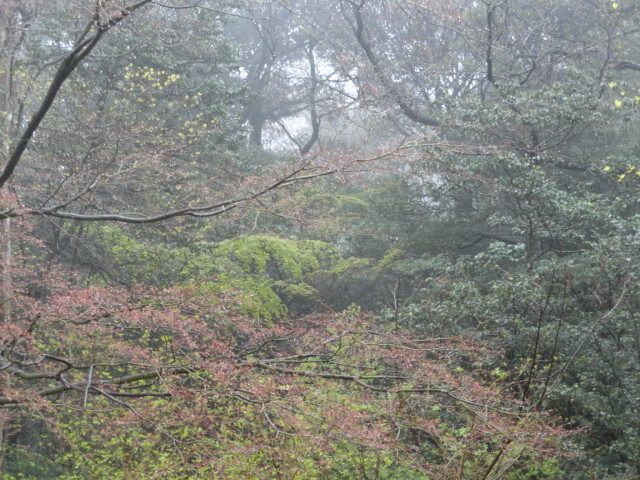 Ogata's body was found in the trees 700-800 meters south of the POW camp. 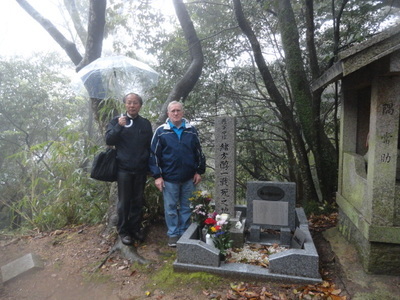 "Front view" states: Captain Junichi Ogata was killed near this site on March 17, 1945. "Captain of the 56th Fighter Squadron. Died 26 years old. From Kumamoto Prefecture." 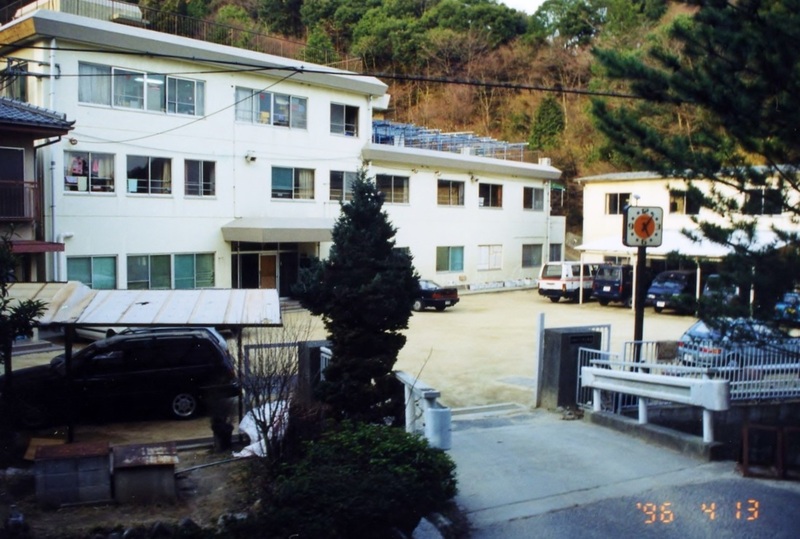 These two photos were taken in 1996 by Toru Fukubayashi showing what was located on the site of the Hyogo-Ken POW camp. These buildings are now gone and nothing exists where the POW camp once stood.